It's been a little while since my last Nailbox. I found that I was a bit overwhelmed with nail polish after a couple of months of boxes but this month I resubscribed to a 3 month subscription, ready to try out some new things. This month's box is themed around Easter and Spring but I'm not all that sure it lives up to it's expectations. 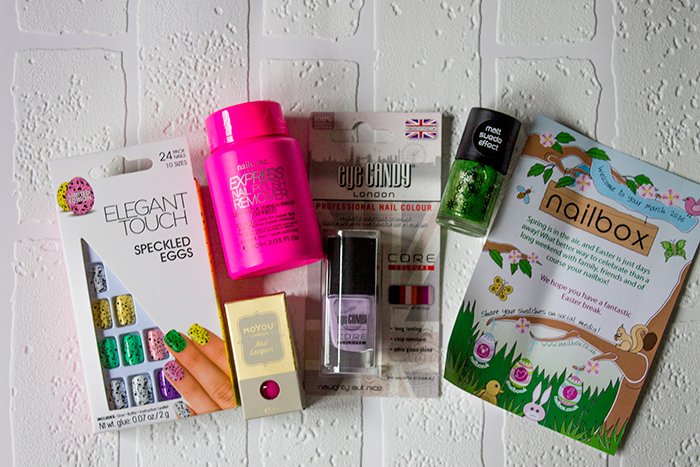 In this month's box, I was happy to receive the Elegant Touch Speckled Eggs False Nails as I'd recently tried out their Don't Be Sheepish set and really loved the quality. I do already own a few of the speckle polishes from Illamasqua but for someone who doesn't want to buy all the shades but get the same effect, I think this set of false nails is a great idea. Nailbox had hinted at Nails Inc making a return to the box so I knew to expect a product from them but I was surprised to find it was the Nails Inc Express Nail Polish Remover Pot. I've dabbled in a few versions of these pots and I do enjoy using them but I find they never last quite as well as your typical nail polish remover, it's definitely more for convenience than quality removal. That said, I'm looking forward to seeing how the Nails Inc version compares with other brands. In my opinion, the nail polishes in this month's box were a little disappointing on first glance. Being an Easter themed box, I expected colours of more of a light/pastel variety so I didn't really understand why these shades were included in the box. In the box we have: Eye Candy Naughty But Nice, a lilac shade which is probably the closest thing to an Easter shade in the box. This is followed by the Invogue Matt Suede Effect Polish in Emerald Dust, a polish made by the same company as Eye Candy. Last in the box is the MoYou Nail Lacquer which doesn't seem to have a name and even though it might not be the perfect shade for the box, I'm looking forward to testing it out on my stamping plates from the brand. Overall, I think there's been better boxes from Nailbox in the past. I think having more colours that complement each other and the theme would have been better, plus perhaps a nail polish from a more well known brand of better quality. I'll still keep my subscription going but I hope next month's box is better.